I went outside in the garden because daddy had bought fireworks. I saw beautiful pink and silver sparkly ones popping and banging and then when all the big fireworks were done daddy actually let me hold two fireworks of my own. Fireworks are great fun. 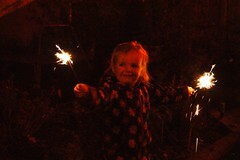 Amaia didn't like them though - she was much happier watching them from the bedroom window once mummy put her inside. Am I maybe 3 now?